At the bottom of Grafton Street, pedestrian William Garcia ignores the red man and walks across Suffolk Street. Jaywalking is illegal, but Garcia says it he felt it was safe to cross and so he did. “There were no cars, so I was confident I would make it across,” he says. 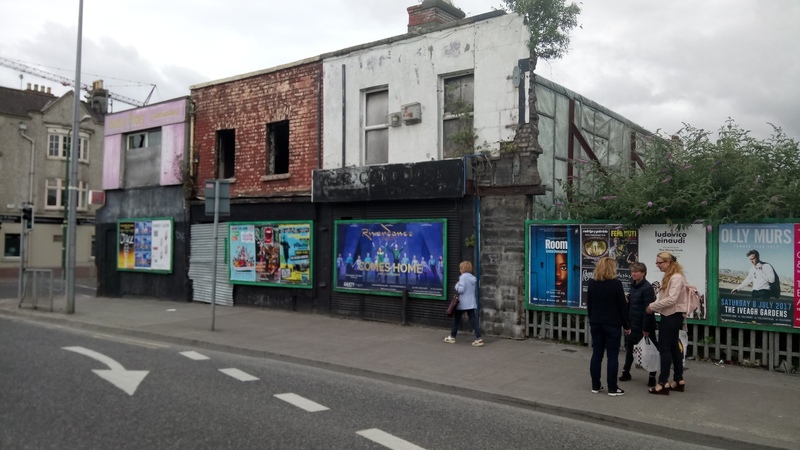 The city and its people do not always agree on the paths Dubliners should take through the capital’s streets – formal pedestrian crossings and man-made desire lines, traffic lights and people’s impatience combine to shape and regulate the flow of foot traffic. It seems like jaywalking is quicker, which is why we do it, but is it really, given that jaywalkers may just get caught halfway across the road? If so, how much faster is it? Is it worth the risk? In Dublin city centre on a spring day, there are plenty of pedestrians who take a chance and cross the road while the pedestrian lights are red. On O’Connell Street, Nicole McGovern says she crosses the road when it is not her turn “because I want to get to places faster”. Most their decision on whether to wait or just wade right in depends on a combination of confidence and perception of risk. If they are certain they can make it across the street unscathed, or feel the risk level is low, most say they will take the chance and cross. “I don’t see why I should stand and wait until a light tells me what to do rather than using my own judgement,” says Annette Brennan. Another pedestrian, Jordan Smith says there’s a “culture of jaywalking in Dublin”, and it is safer to move with the crowd. Maria Stephens, who has lived in a rural village for most of her life, says she always waits for the green man because she is not used to a heavy traffic of Dublin city centre. Kelly McGovern says she tends to “jaywalk a lot, crossing the streets, mainly because there are not actually many pedestrian crossings, and I’m too lazy to walk to one”. 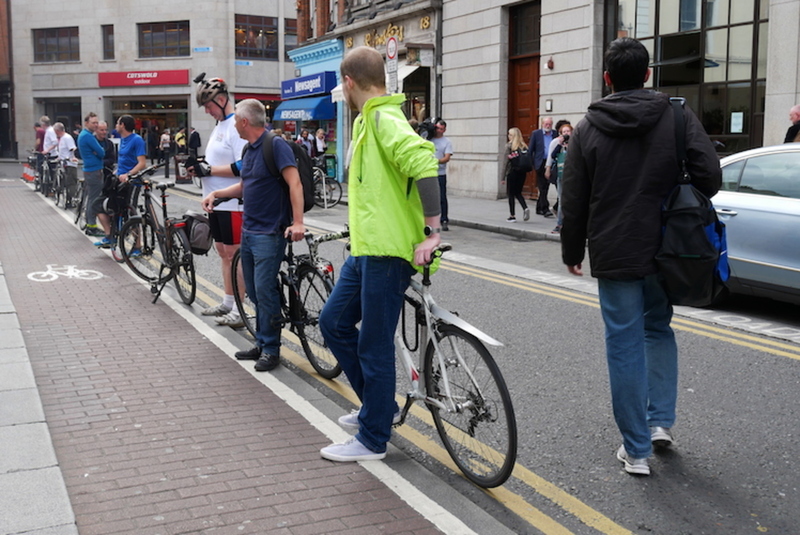 Under the direction of Dr Eoin O’Mahony, we did a walking survey of Dublin streets to verify that it is faster to jaywalk than to wait at the lights, and to find out how much quicker it is – what’s the reward earned through the risk? We four researchers from the MA class at the UCD School of Geography walked from Connolly Station, down Lower Abbey Street, and around to the Spire. They then walked from the Spire to the bottom of Grafton Street. And they took a final walk from Dawson Street to Pearse Station. On each route, two researchers abided by the law, waiting at each light for the green man to appear so that they could cross the road legally and safely, and two walked by crossing whenever they had the opportunity to do so. Using the MapMyWalk app to track our walks, the researchers compared the time differences between jaywalking and crossing at lights. On the first two routes, it was approximately 20 percent faster to jaywalk. The last route proved to be 8 percent faster. If jaywalking is faster, what’s the problem? Well, being a pedestrian can be dangerous. Provisional statistics from the Road Safety Authority tell us that there were 35 pedestrians killed nationwide in 2016, which was 19 percent of all road deaths that year. In Dublin, there were 21 road deaths in 2016, and 10 were pedestrians. So, at 48 percent, the percentage of fatalities involving pedestrians is much higher here than the national average. We know that alcohol is a factor in almost half of fatalities involving pedestrians in Ireland, but we don’t know whether jaywalking played any part – to our knowledge there’s been no research on that. There are laws in place to protect and regulate pedestrians. They regulate where pedestrian lights are placed as well as when and where pedestrians can cross, outside of zebra crossings. One law says a pedestrian cannot cross a street within 15 metres of a marked crossing; she must move to the crossing. This provides a loophole, if there isn’t any crossing within 15 metres. But in Dublin city centre, there aren’t many places this will apply. Rather than trying to change the course of the river of pedestrians, another option would be to accommodate it by adding more crossings. So will the council be doing that? 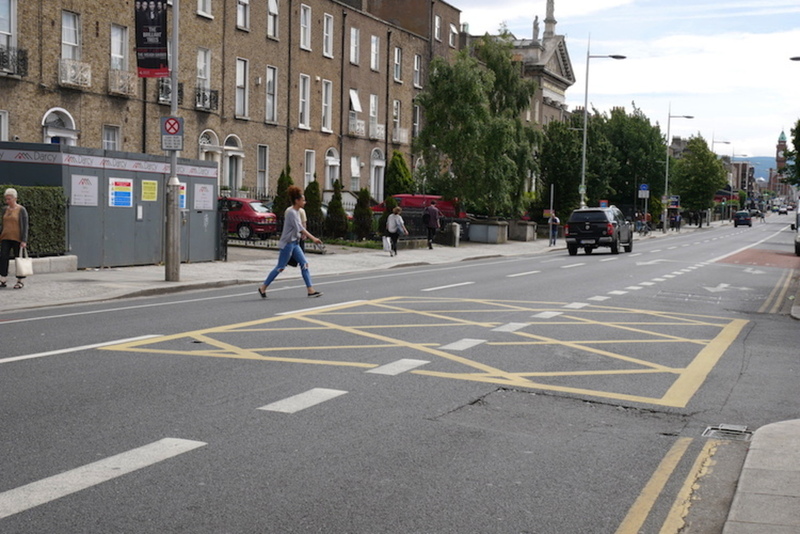 “It is not always possible to provide pedestrian crossings in every location from an engineering point of view,” said a Dublin City Council spokesperson. Reporter Laoise Neylon contributed to this article. Emma Curran, Linda Heerey, Alexandria Pruden and Clare Savage: Alexandria, Clare, Emma and Linda are MA students at University College Dublin, studying geography and urban environment. They are working towards degrees with focuses in cultural geography, historical geography, urban geography, and fluvial geography, respectively. Not sure jaywalking laws are in place to protect pedestrians – it’s more to ensure that traffic flows smoothly and that drivers aren’t inconvenienced by the proles in their bróga. Jaywalking in Dublin is an extremely mild case of fighting the power. The article omits one of the chief motivators for jaywalking: inefficient pedestrian lights that remain red for far longer than necessary at many crossings – even when all car traffic that could drive over the crossing is halted. No wonder frustrated pedestrians ignore them. Recalibrating existing lights could do a lot to reduce jaywalking, and increase pedestrian trust in traffic lights. If the city wanted to invest, I’d suggest adding Belisha beacons, which don’t restrict either car or pedestrian traffic unless someone’s actually crossing. Good piece. The “beg buttons” are placebos–designed to give the appearance of pedestrian controls whereas in fact all lights are timed to stingy crossing times. The only exception in Dublin are the lights in front of Leinster House. Given the contempt shown to the citizens by Dublin City Council and the national government, it really is no surprise that pedestrians would treat the traffic lights (which seem indeed to be there to ensure traffic flow, not pedestrian safety) and jaywalking laws with reciprocal contempt. I jay walk because it’s quicker, you have to wait far too long for pedestrian lights to change- when they exist- if pedestrians who walk and use public transport were given equal road crossing rights as individuals in cars there would be no need to jay walk and everything would run smoother. It takes too long for the red man to turn to green…. maybe he should become a radical she…. The whole system favours the car over all else. You stand by a pedestrian crossing for several minutes and when the light goes green allowing you to cross you literally have 10 seconds to do so before it turns red again! I don’t know how the old or infirm manage it. And worse, the junctions that both the traffic light and walking light are inexplicably both red! Even the feckin’ Luas stops at traffic lights. You have to jaywalk. Since you don’t know how many, if any, pedestrians were killed while jaywalking it seems strange to bring up all that information about pedestrian fatalities. Do we know how many of them were killed by a car going through a red light and hitting them while the pedestrian light was green? I agree with all the other posters who indicate that the main reason pedestrians cross on red is that there is so little time given to pedestrian crossings. Do another survey. Pick 10 busy junctions and see how much green time is there for pedestrians versus cars. There are plenty of pedestrian crossings in the city where if I miss my 30 second slot I may be waiting for 3 or 4 minutes for the next one. Saying pedestrians do this because they “want to get there faster” but I don’t think that’s really accurate. Why don’t you randomly stop for a couple of minutes every hundred metres on the way to the shops? Is it because you “want to get there faster” or because you don’t see any reason to do so? I don’t see any reason to wait for a light when there are no cars coming. The idea that people may get caught in the middle of the road is a bit far fetched too. Far too rare an occurrence to bother mentioning in my opinion. How many times did your researchers get caught in the middle of the road? The 15m limit on the jaywalking law is hardly a loophole. That’s like saying there is a loophole in the motor tax laws where you can avoid paying by not having a car. If you don’t think there are a huge number of places where you are more than 15m from a pedestrian light in Dublin then you either don’t know Dublin very well or don’t know how far 15m really is. Don’t forget that lots of traffic lights don’t have pedestrian lights at all. If you redo the survey try including some junctions where pedestrians have to cross multiple roads because the shortest route has no pedestrian light on it. I’d be very interested to see a comparison between the average red light waiting times for pedestrians &amp; length of green lights in Dublin versus several other large European cities.. Having lived away from Dublin for a few years the long wait times at red lights was something that was particularly noticeable / frustrating about walking around the city when I moved back. Would also echo the comments above also about the number of intersections which appear to be very inefficiently sequenced, you sometimes have 15-20 seconds standing around where all traffic lanes in front of you are on red lights but you’re still not allowed to cross. I’d be interested to see some data on the amount of vehicle passengers who pass through a given set of lights in a cycle, versus the amount of pedestrians who cross during the same cycle. Clearly much more time is allocated to vehicles, but I wonder if that extra time is proportional to the amount of people who get through, or is it biased towards a particular group. Would probably need to run for a while to average out the numbers; for instance, one full bus would swing the numbers hugely compared to single-occupancy cars. 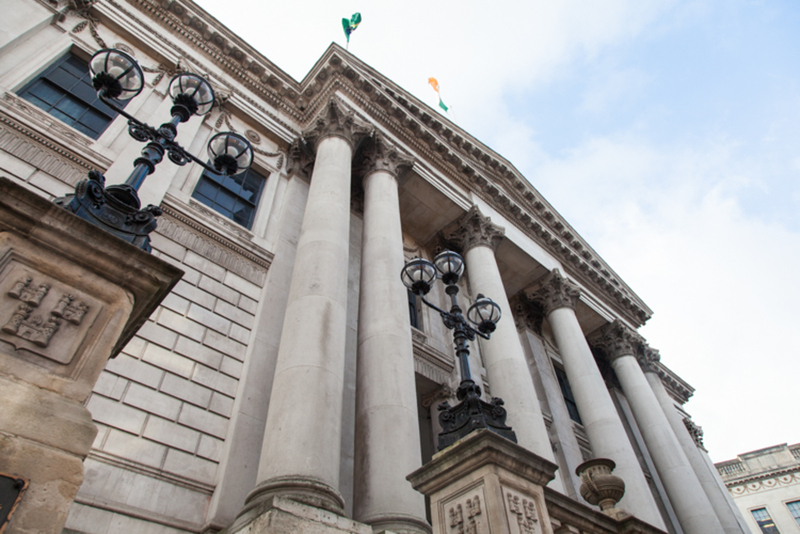 Report traffic sequencing faults to traffic@dublincity.ie – they will assign a reference number and refer the issue to the ITS (Intelligent Transportation Systems Section). I’ve already reported several sequencing issues I’ve observed where pedestrians are waiting at lights unnecessarily. There is definitely a “jaywalking culture” in Dublin, both justified and stemming from ignorance or simple disregard for the rules, like one of the lady’s quoted in the article so fittingly illustrated. Justified, because there are not enough crossings (there are so many stretches of road longer than 15m with no sign of a pedestrian crossing) or the light’s sequence doesn’t make any sense and punishes people who walk. And then there is another type of jaywalker, one that is very common to Dublin in particular, who simply crosses wherever and whenever, with total disregard to other traffic. Sometimes people are too lazy to get to an existing nearby crossing. Sometimes I wonder if this sort of behavior just reinforces the belief that zebra crossings are bad/ why bother fixing crossing sequences if people just do how they please anyway. Also, drivers seem to pay no mind to this: (2) When starting from a stationary position a driver shall yield the right of way to other traffic and pedestrians. (3) A driver of a vehicle approaching a road junction shall yield the right of way to another vehicle which has commenced to turn or cross at the junction in accordance with these Regulations and to a pedestrian who has commenced to cross at the junction in accordance with these Regulations. I’d love to see Dublin become a lot more pedestrian friendly, it would be so much nicer and even cyclists would see benefits from it. 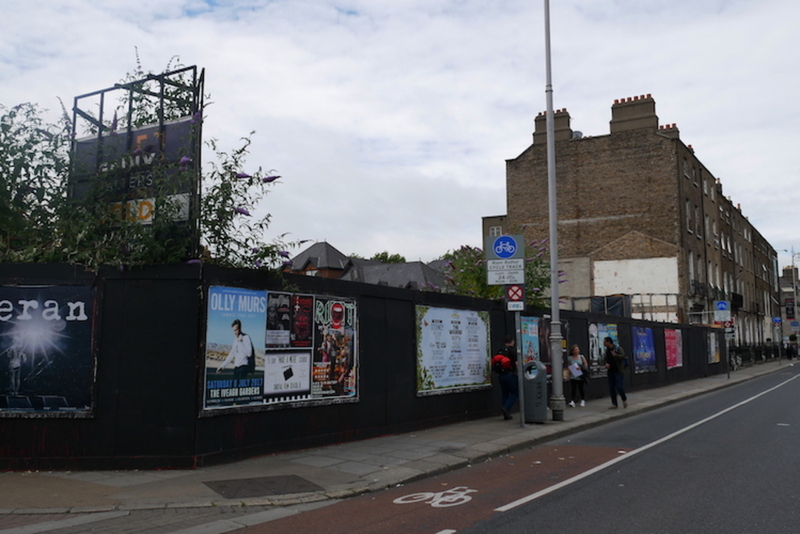 A recent campaign, #makewaydublin, seems to have been all but forgotten by the Lord Mayor.